The Panda Systems are our latest growing units. 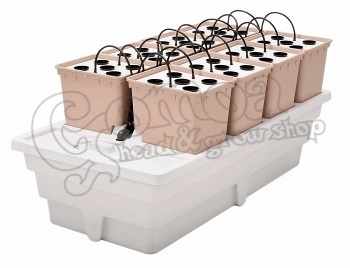 A little smaller than the Dutch Pot Systems, they allow you to grow from 8 to 40 plats, depending on the size of the plants you are growing. In «Hydro» or in «Aero» versions, the Panda Systems are easy to assemble and user-friendly. They are self-contained, to prevent leaking. Their rectangular shape (124 x 62 x 53 cm) makes them easy to use in any small area. Its large reservoir (150 L), for a relatively small amount of plants, guarantees a good water supply and helps regulate the pH level. White outside to reject heat and protect the nutritive solution from high temperatures.